A new smartphone app provides convenient access to the US Constitution Annotated - also known as the Constitution of the United States of America: Analysis and Interpretation. This app will assist researchers of topical constitutional law and make it easier to find amendments, unconstitutional federal and state laws, and recent cases. This resource is constantly updated with an index and analysis of recent Supreme Court case decisions. The app is available for iOS on iPhones and iPads. An app for Android devices is in production. A searchable version of the resource is available on any device or desktop computer from the Constitution Annotated webpage: http://beta.congress.gov/constitution-annotated/. Get two free CLE credits, including one ethics credit, when you attend volunteer training for the Veterans Law Center at UW Madison. The training session takes place on October 4th from 9-11 am at the UW Law School Lubar Commons (Room 7200). RSVP online by September 27th. The Veterans Law Center is a free walk-in legal clinic serving low income veterans and their families. Volunteer attorneys, paralegals and law students provide brief legal advice, information and referrals on civil legal matters. Our classes page is full of CLE credit opportunities for the fall. Sign up for Ethics Research via Westlaw or Wisconsin Briefs Online at the Wisconsin State Law Library training room in Madison, Wisconsin. In Milwaukee, watch for registration information for classes on using WestlawNext and HeinOnline - two legal research databases offered at our three library locations. Bohr's Social Security Issues Annotated is a 2 volume loose-leaf set that is updated annually. This set is geared towards the drafting attorney practicing in Social Security law. 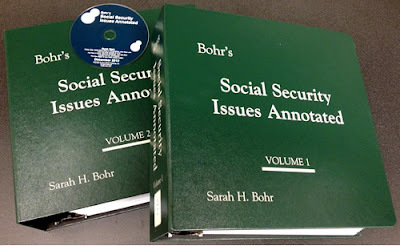 The author, Susan Bohr, is an appellate attorney who has specialized in Social Security law for 30 years. The checklists, issue specific sample briefs, and summary of cases have all been developed from her real world expertise. This set comes with a companion CD that allows you to search and access the full-text of the book, as well 120 model briefs (not included in paper). This tool makes incorporating the text of persuasive pattern arguments in your own writing both quick and easy. While the James Publishing Search program feels a little clunky, it does facilitate a comprehensive review of your topic throughout the set. The text of the briefs can be found in a separate folder on the CD. Unfortunately, they do not appear to be searchable through the main search program. You will find an examination of common errors in ALJ decisions and a checklist of issues that can be raised in the Appeals Council, as well as federal courts. There are also detailed case surveys for sequential evaluation, assessment of disability, specific impairments, non-disability issues, administrative review, federal courts, attorneys' fees, and source of law issues. In addition, the author focuses on 44 specific disability issues, including several specific impairments. For these issues you will find summaries of the applicable statutes, regulations, rulings, POMS (Program Operations Manual System), cases, and practice pointers. Look to this set if you are writing a brief for your next SSA case or drafting a SSA appeal. If you are looking for more of a primer on Social Security law, you might be better served by a title such as Handling a Social Security Disability Case (NBI). This summary page of the proposed bill will provide an overview of the topic, a link to the full text bill, any amendments, memos from legislative service agencies, fiscal estimates and more. This information is continually updated and citizens can follow the progression in the "history" list, with links to the Senate or Assembly Journal. 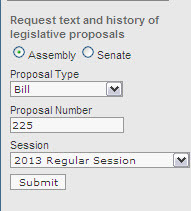 To stay informed on the progress of specific bills or committee activity, sign up for the legislature's Notification Service. This free service provides daily updates via email. Each proposal overview also includes a link labelled "Government Accountability Board Information." This link will take the user outside the legislature's website to the GAB's "Eye on Lobbying" page. The direct link provides an immediate look at which entities are lobbying on this bill. The Eye on Lobbying website is another resource we suggest for investigating the legislative process. As indicated in the tabs at the top of the website, the focus is on "who" "what" and "how much." Who is lobbying in Wisconsin? What are they lobbying about? How much time and money have they spent? Finally, for a front row seat, visit the WisconsinEye website. Here you can watch hearings and debates as they happen. You can also delve into the video archive to see not only legislative activity but events from the administrative and judicial branches, as well as local government and community coverage. September 11th is observed as National Day of Service and Remembrance. President George W. Bush approved Public Law 107-89 on December 18, 2001. This joint resolution designates September 11th as Patriot Day. In 2009, President Barack Obama signed Public Law 111-13, the "Serve America Act" which names September 11th as a National Day of Service and Remembrance. Americans are encouraged to honor the heroes and victims of 9/11 by serving in their communities. To promote volunteerism and unity throughout the year, the Serve.gov website acts as a gateway to register projects and find volunteer opportunities. School bells are ringing again across the State of Wisconsin. State law requires at least 180 days of instruction. Wisconsin Administrative Code PI 8.01(f) allows for only five of those days to be used for non-instruction, such as parent-teacher conferences or snow days. In addition, unless given DPI approval, public school districts may not commence the school year before September 1, see Wisconsin Statute 118.045 and Administrative Code PI 27.03. Although school cannot start before September 1, the law does not prohibit any school district from holding year-round school. For additional information related to school attendance, see Answers to Frequently Asked Compulsory School Attendance Questions. from the Department of Public Instruction.